You're about to read about the biggest mistakes kayak anglers make. But you know we're not going to stop there. You'll learn how to avoid them, and ultimately how to catch more fish. This is the second article for our site that Sonny Mills has written. We're glad to welcome him back after his valuable contribution regarding Marsh Fishing Tips. Dale Carnegie once said, “The successful man will profit from his mistakes and try again in a different way.” Most successful anglers can relate to this quote because trial and error is how the majority of us have gained the knowledge we posses. 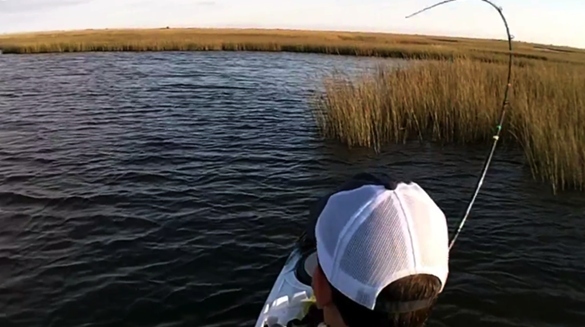 Below is a list of seven mistakes kayak anglers make while fishing the shallow marshes along the gulf coast. One of the first mistakes kayak anglers make happens before even getting on the water. Shallow marshes are greatly affected by the rising and falling of the tides. As the tide rises, water flows into a marsh, allowing both bait and predator fish access to areas they do not always have. As the tide falls, the water is pulled back into the bays, concentrating both bait and predator fish into smaller areas. The majority of us check tide charts to determine the tide height and to see if it will be rising or falling. However, most people fail to compare predicted tides with actual tides. If you plan on making a trip to sight cast reds in the marsh on a low tide, and the water is running a foot lower than predicted, it is possible there won’t be enough water for your kayak to float. The picture below was taken from the NOAA website and shows that the actual tide on April 5th was running about a foot lower than predicted. This sudden drop in water level was caused by a strong northern wind that drained a lot of water from the bays and marshes in the Galveston area. By visiting the NOAA website at http://tidesonline.nos.noaa.gov/geographic.html, you can choose your state, followed by the closest tide station to your location. Then you can compare the actual tides with the predicted tides to see if they are running higher, lower, or as predicted. Knowing this information can tell you a lot about the area you plan to fish before you even arrive. 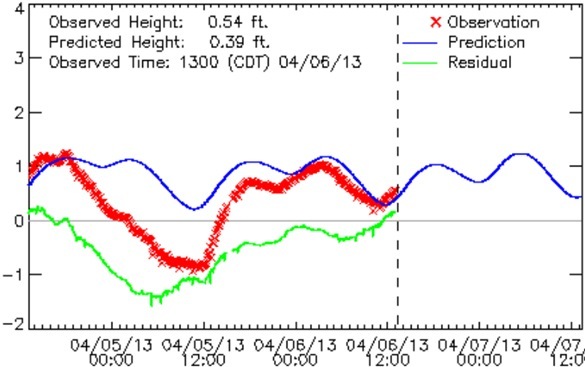 The actual tide height is in red, while the predicted tide height is in blue. To stay on the subject of tides, another common mistake kayak anglers make is time spent fishing a slack tide. A slack tide refers to water that is neither rising nor falling by more than a couple of inches over the course of a few hours. Moving water triggers a fish’s natural instinct to feed; small baitfish and shrimp have a difficult time escaping while swimming against a current. This makes them a much easier target for all predator fish. For this reason, fishing water that is moving can greatly increase your odds of success. This does not mean that fish won’t feed during a slack tide, only that your chances for a successful trip will likely decrease. During the hot summer months I try to plan my trips either early in the morning or late in the evening, depending on which part of the day has the best tidal movement. Not only does this keep me from being out in the 100 degree heat, it is also when the fish tend to become more active. Shallow marshes with only a few channels connecting them to the main bay will heat up pretty quickly when the sun is high overhead. As the water heats up, the fish seem to become less active and head for slightly deeper water to beat the summer heat. Once again, this does not mean that fish are not present in the marsh, or will not feed during the middle of a hot summer day, just that they are normally less active until things cool down a bit. 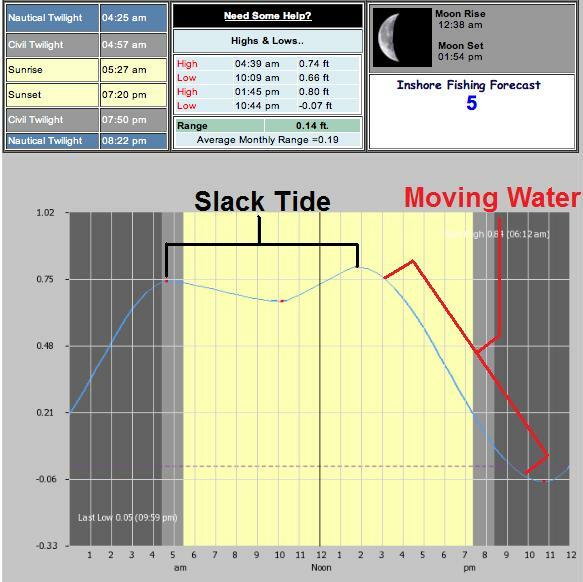 Below is a picture showing the difference between a tide that is moving and a tide that is slack. If fishing on this particular day, an evening trip would probably produce better results based on the fact that the tide will be dropping nearly a foot over nine hours. In the morning the tide appears to fall about one inch over five and a half hours and then rises one inch over the next three and a half hours. Try to plan your trips around moving water and the odds that you will have a successful trip will greatly increase. I spend a lot of time reading fishing reports and try to be observant of the locations others choose to fish while paddling to and from my spots. One thing I have noticed regarding ninety percent of kayakers is that they do not take advantage of one of the greatest capabilities provided to them by their kayak, which is the ability to fish shallow water (less than a foot deep). When it comes to shallow water, redfish are fearless. They have no problem crawling through water, where your kayak is unable to float, in search of baitfish, shrimp, crab, or other food sources. A big mistake kayak anglers make is not targeting redfish in shallow water. In my opinion, sight casting to crawling and tailing reds is as good as it gets while on the water. The skill and stealth required to land that perfect cast, which will convince a spooky fish to eat instead of blowing out, is a real challenge when you take into consideration your nerves, the wind, and other factors that always seem to arise. The bottom line is that if your kayak can get there, so can a redfish. Do not be afraid of getting a little muddy and exploring a few shallow areas. When most people see a backing or tailing redfish, their first instinct is to grab their rod and make a cast within five seconds of spotting the fish. Most of the time this results in a missed cast that spooks the fish, causing it to blowout. One of the mistakes kayak anglers make is to rush this first cast. It's not easy to wait and take about thirty seconds to observe the fish’s behavior and see what it is doing before making a cast. But by doing so, you give yourself enough time to calm your nerves, move a little closer, and wait for the fish to give you the proper angle needed to make a successful cast. A left to right movement is preferred over a fish moving directly away from or towards you. Given enough time, the fish will normally give you a decent shot at making your presentation. Those thirty seconds you spend observing will greatly increase your odds of making a successful cast. Poor lure placement is one of the biggest mistakes kayak anglers make when sight casting to a visible fish. 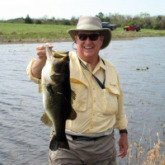 Most people spend a lot of time perfecting their accuracy with a rod by casting at a particular target until they can consistently hit or land within a few inches of it. While this is great practice, it can also result in a subconscious mistake when you spot a fish. 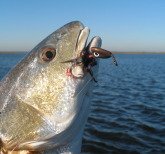 If a lure lands on or within a few inches of a redfish while sight casting, it is likely that you will never see that fish again. The goal when casting at a visible fish is to have your lure land about three feet in front of and three feet past the fish. This keeps the fish from getting spooked and gives you the opportunity to slowly work your lure back into its path. Lure selection is also critical due to the fact that the fish are so exposed and easily spooked. 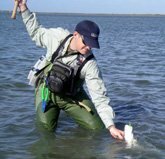 When I am fishing really low tides, and know that redfish are going to be visible, I make sure that I have on a very small and soft landing lure. My first choice in this situation is any one of the Buggs lures that weighs less than one fourth of an ounce. These lures land very softly and allow me to cast within a few feet of a completely exposed fish without spooking it. As the lure makes contact with the water, the splash is so soft that it appears to be like nothing more than a fleeing shrimp or baitfish. Once in the water, the Bugg always sits with the hook facing up, and the bunny hair looks great as it undulates with the movement of the water. A small twitch or slight drag across the bottom will cause a little puff of smoke from the mud to appear which resembles a shrimp, crab, or baitfish trying to escape. This movement is usually subtle and natural looking enough to entice a fish into striking without causing it to blowout. One of the biggest mistakes kayak anglers make is casting too big of a lure too close to the fish. By choosing a small, soft landing lure and by leading the fish a few feet, you give yourself the best opportunity to hook up with a skinny water redfish. Read about all of the Saltwater Fishing Lures we offer. Follow the link to the Buggs Fishing online store. When redfish are in shallow water, all of their senses are on full alert. The slightest sound, movement, or vibration through the water can send them running for several dozen yards before they even think about slowing down. Therefore, one of the biggest mistakes kayak anglers make is spooking fish by making unnecessary sounds. For this reason, every movement you make should be made with extreme caution. How you paddle, handle equipment, or make sudden movements can alert a fish to your presence. One technique I like to use while moving through shallow water is to pole myself around instead of paddling. I do this by sticking the blades of my paddle about three inches into the mud and propel myself forward instead of actually paddling the water. I find that I can move around more quickly and quietly by using this method. While handling equipment such as rods, tackle trays, or your paddle, it is important to always set things down as softly and quietly as possible. Vibrations caused by items coming in contact with your kayak can send sound vibrations through the water that can easily spook fish. Installing a silent traction system is a great way to eliminate some unwanted noise. These rubber pads can be placed onto various locations around your kayak and help to reduce noise caused by incidental contact from equipment. Silent traction systems are available through many online retailers and can also be found where most kayak products are sold. The ability to move slowly and silently through the water while being cautious with your equipment can increase your chances of getting within a good casting distance of your target. Many people overlook how much physical activity is involved in kayak fishing. Whether you are young or old, a beginner or veteran, paddling or peddling, your body is using energy and fluids that must be replaced every so often. Although more common during the summer, heat exhaustion and dehydration can occur anytime you do not stay properly hydrated. While many of us carry a few bottles of water and/or sports drink with us on each trip, we often forget to actually drink them. A big mistake kayak anglers make is not drinking enough fluids. There is something about fishing that stops your body from letting your brain know that you are thirsty and need fluids. I try to drink a bottle of water while driving to my launch site and another one before I start my paddle back to the truck. I do my best to drink and snack in between, but I am also guilty of forgetting. By drinking these two bottles, I can at least be sure that I’m getting around thirty four ounces of fluids during a trip. On trips that I consider a short paddle, or if I don’t plan on staying long, I like to throw a few frozen bottles of water in to my crate. These will thaw out over time and provide me with cold water to drink. If my trip involves a long paddle, or if I plan on staying out most of the day, then I like to bring a small ice chest that I can place in my rear tank well. I will keep a few bottles of water, sports drinks, and a couple bags of peanuts iced down to keep myself properly hydrated and energized. 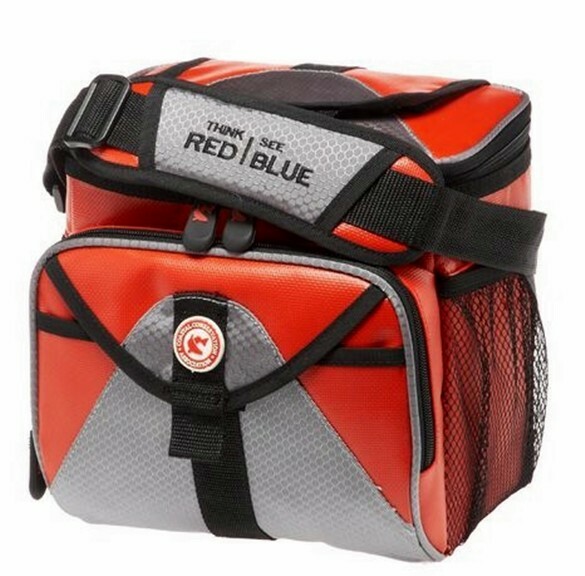 While a cooler may add another item to your kayak, the trouble it can save you from is definitely worth the added weight. This is one of the mistakes kayak anglers make that could affect your health, but is easily avoided. We started with the Dale Carnegie quote about learning and profiting from mistakes. A big thanks to Sonny Mills for sharing these biggest Mistakes Kayak Anglers Make and how to avoid them. We'll all profit from this knowledge gained through the countless hours Sonny's spent fishing the shallow marshes of the Gulf Coast. Sonny makes regular contributions to his blog that includes more good tips. Follow the link to read more. Follow the link to Sonny's blog for more tips on saltwater kayak fishing.